Since we’ve already covered Mark Buehrle’s perfect game, a large comeback with a controversial ending is our game of the week. Gio Gonzalez pitched horribly from the get go. After forcing two quick outs in the first, he issued walks to Justin Morneau and Michael Cuddyer before yielding a three-run shot to Jason Kubel. With the bases loaded in the second, Justin Morneau worked a full count before popping ball deep down the right field line that landed in the bleachers. Just like that, the score was 7-2. Three pitches later Cuddyer struck again, connecting with a solo shot. The Twins put runners on the corners before Gonzalez would finally escape the second. The third would be no different. 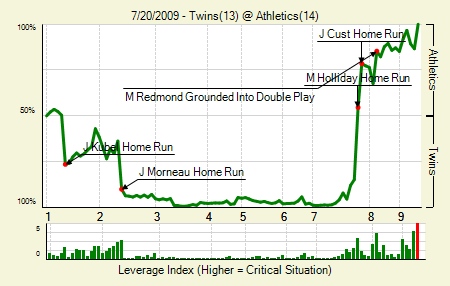 Already trailing 8-2, Gonzalez would have two runners on as Justin Morneau came up again. On a 2-2 pitch Morneau homered again. With an 11-2 deficit, 1% chance of winning and Cuddyer due up, Santiago Casilla entered the game. He would allow an unearned run, but kept the score intact over the next inning and two-thirds. In the third Matt Holliday double, Jack Cust would single, and Daric Barton hit a two-run homer, putting the A’s seven back. In the fourth Holliday homered with a runner on, making it a five run ballgame. After a sac fly in the 5th, the A’s trailed 7-13 entering the bottom of the seventh. Brian Duensing would walk Barton and allow two singles before being removed. An Orlando Cabrera double pushed two runs in. Then Scott Hairston walked and Matt Holliday would get a chance to tie the game. Tie it he did. A grand slam from Holliday ended Bobby Keppel’s night after only three batters. Ron Gardenhire brought Jose Mijares into the game and probably regretted it a pitch later as Cust hit a go-ahead jack. The A’s had not only came back from 10 down, they were now in position to win the game. Flash forward to the ninth with Michael Wuertz on the mound. Cuddyer would double, putting the tying run in scoring position. An intentional walk later, Wuertz would throw a wild pitch that bounced deep into the cavernous foul territory. Cuddyer would round third and head home, sliding underneath the tag, but still being called out. Game over and without any instant replay, the Twins could do nothing but yell. The ending is unfortunate because A) the call looked to be incorrect and B) took away the thunder and buzz from the A’s impressive rally. Not every day do you see teams who rank in the bottom half of the league in offense score 10 runs within one game. 14 runs? No way. We hoped you liked reading Game of the Week: 7/20-7/26 by R.J. Anderson! The worst thing about the play was that it wasn’t even close. He had slid all the way across the plate and had his foot on the back corner of the plate (CLEARLY within view of the ump) by the time the tag finally came down on him. The addition of instant replay for home run calls has been completely seamless and has done nothing but please fans, so I’m not sure why Selig refuses to allow any more replay allowed in the game. How does the “human element” of an ump completely blowing a great ballgame make baseball better? I don’t get it.